Huawei's sub-brand Honor has launched Play, a mid-range smartphone with features like a notch-display, dual-camera setup and even a lot of AI features that will put the smartphone's hardware to good use. Huawei's sub-brand Honor has launched Play, a mid-range smartphone with features like a notch-display, dual-camera setup and even a lot of AI features that will put the smartphone's hardware to good use. The new device will be sold exclusively on Amazon India's website and will go on sale on Monday. The Honor Play will be available in two variants, one with 4GB RAM and the other with 6GB of RAM. The device comes with a 19.5:9 display which gives it a tall form factor and helps accommodate a large screen. The Honor Play comes with nifty features like GPU Turbo technology, which the company claims increases the performance of the device by 60 per cent and decreases the battery consumption by 30 per cent. The camera of the device comes with an AI-based feature that lets the user detect objects on the go and find them on Amazon's online e-commerce platform. The Honor Play phone comes with a 6.3-inch display with 1080x2340 pixel resolution. The phone also features a notch on top of the display. The smartphone is powered by Huawei's HiSilicon Kirin 970 AI chipset with four Cortex-A73 cores clocked at 2.36GHz and four Cortex-A53 cores clocked at 1.8GHz. The processor will be paired with either 4GB RAM or 6GB RAM. In terms of optics, the phone comes with dual camera setup with one 16-megapixel sensor and another 2-megapixel sensor. The primary sensor comes with a f/2.2 aperture whereas the 2-megapixel sensor comes with a f/2.4 aperture. The rear camera modules come with an LED flash as well. A front camera is a 16megapixel unit with f/2.0 aperture. The Honor Play comes with Android 8.1 Oreo out of the box but sports Honor's EMUI 8.2. On the connectivity front, the device features Bluetooth 4.2, USB Type-C, GPS/A-GPS, 4G VoLTE and WiFi 802.11ac. The sensors include an accelerometer, ambient light sensor, digital compass, gyroscope, and a proximity sensor. For security, the device features a fingerprint rear on the rear panel. The Honor Play features a 3750mAh battery with fast charging technology. 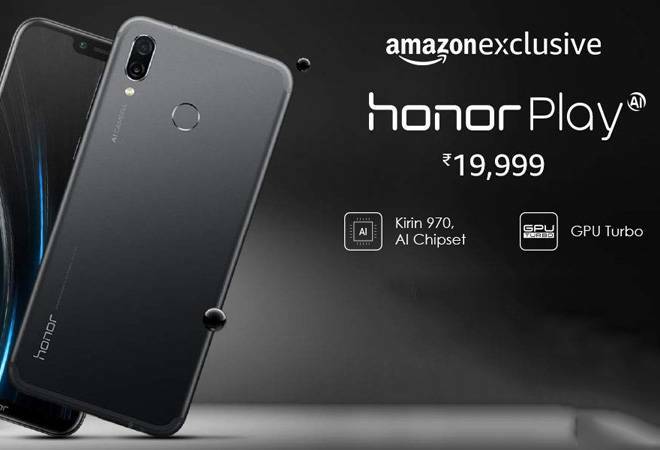 The Honor Play will be available in two variants, one with 4GB RAM which is priced at Rs 19,999 and the other with 6GB RAM which is priced at Rs 23,999. The device is available in two colours, Midnight Black and Navy Blue.